Curry had been a long-standing tradition throughout the world, and it would be nearly impossible to trace it’s history back to its deepest depths in Southeast Asia. But curry in Jamaica is a relatively new phenomenon. Remember that old company you heard about in high school history class, The East India Company? I’m sure the name is familiar. The East India Company, founded in 1600 for the purpose of trade, remained true to its initial purpose for the first century of its existence. During this time it established factories throughout India, eventually acquiring so much power as to become the de facto ruler of much of Northeast India. This eventually led to the British Empire claiming India as its own. The English had already taken over rule of Jamaican from the Spanish in 1655. British-owned Indian slaves in the 18th century (and later indentured servants as slavery was abolished in India) arrived in Jamaica and brought with them the concept of curry. During curry’s time on the island of Jamaica, the ingredients evolved to what we now know today as Jamaican-style curry powder. Jamaican curry powder differs from Indian curries most notably because of it’s use of allspice, but it also often uses a higher percentage of turmeric, giving it a rich yellow color. Many Jamaicans don’t eat pork for religious reasons, and they have a lack of space for raising larger animals. 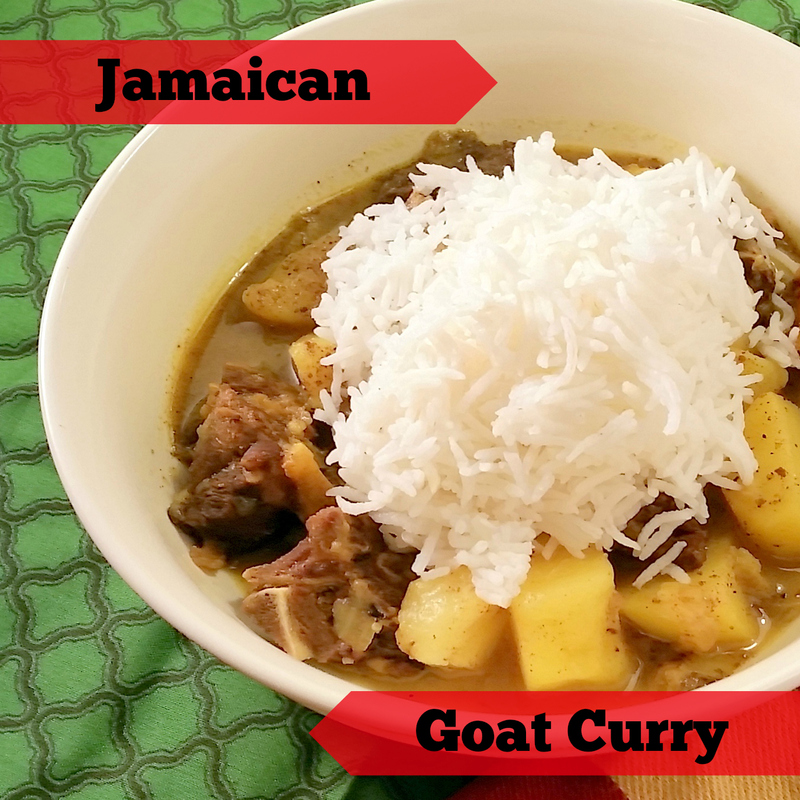 Goats are easy to raise (and they’re delicious), hence the ubiquity of Jamaican goat curry. Goat meat is one of the leanest red meat on the market: only ostrich is leaner. It’s lower in both calories and cholesterol than even chicken and turkey! Want to lower your impact on the environment through food? Eat goat and not beef! Since they eat brush and weeds, goats reduce competition of resources for pasture plants. Most of the goat meat sold in the US is imported from small, international farms, which means you’re unlikely to find the meat pumped full of antibiotics. Awesome! Now, on to the sauce. Mmm, sauce. I could really go for some Jamaican Goat Curry right about now. You’re hungry, too, I know it! You want to learn how to make it, don’t you? I knew it! In a large French oven or stockpot, heat the oil over medium heat. Toss the goat meat with the salt, black pepper, thyme and curry powder, coating evenly. Fry the meat in 2 batches in the oil. When all the meat is brown, return it to the pan, add 1 cup of water and bring it to a boil. Reduce the heat to medium low and cover. Let simmer for about 1 hour. Add onions and the whole Scotch bonnet pepper to the pan, add the remaining water, and return to a simmer for 30 minutes. Check the cooking liquid for heat levels and remove the Scotch bonnet if desired. Add potatoes and ketchup to the pot. Return to a simmer and cook another 30 minutes, or until the meat is tender and falling off the bone. Fish out the Scotch bonnet if you haven't already and serve. So what do you think? Does the idea of eating goat get your goat, or does it make your mouth water? Are you enjoying Recipe for History? Leave me a comment and let me know how I’m doing! Thanks!